Las Vegas - Parasol Advanced Systems of Vancouver, BC, Canada, is literally spinning after the enormous success of LDI 2013 and the debut of the new STAR600 system, as well as the incredible reaction to the KLR Kinetic Light Ring and award-winning Parasol ACS Autonomous Carrier System shown at the event. For those unfamiliar with Parasol, envision a typical live production application where moving lights are used. They are almost always bolted or fastened to a fixed truss and do not move from their rigged point. The Parasol system is an alternate means of moving the source point of a number of automated lighting fixtures along a pre-defined path. Parasol’s unique patented technology now allows moving lights, lasers, or even cameras to be fixed to moveable carriages that glide the lights along a predefined guide way or track. They are self-propelled, motorized carriages that are controlled by wireless technology. The tracks can be any shape that is appropriate for the event, concert or structure. 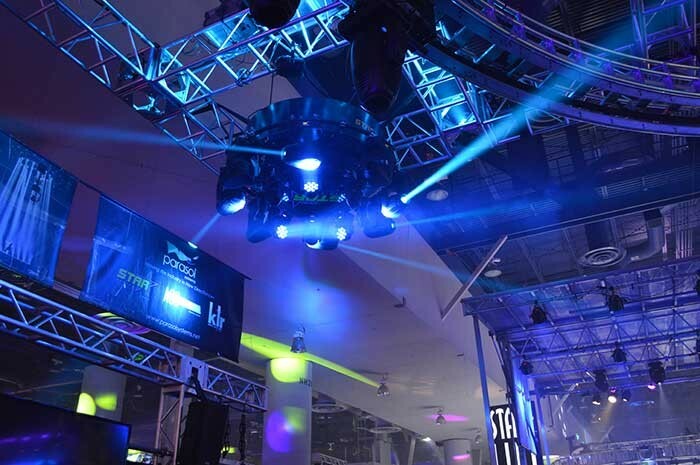 The STAR600 is a new, compact, highly tourable rig with the user’s specified lights pre-set on a circular track. Operated via DMX, it is a rotating, one piece, plug and play unit. It can be set up in literally five minutes, creating stunning new lighting effects. The STAR600 is engineered and priced for every budget and its debut was extremely well received by the hundreds of visitors to the booth during the show. The STAR600 can handle up to 600 pounds of payload and has 30 amps of power available for the choice of luminaires or other devices. It is a highly portable and affordable package and is perfectly suited for touring or in small to medium sized venues including nightclubs, theaters, EDM events, casinos, cruise ships, houses of worship and television studios. The STAR600 Touring Road Cart can be pre-rigged for a quick and easy load in – typically less than five minutes. Expandable diameter options are available and these units have absolute positioning and multi-ring control. Professionals from a myriad of lighting practices found the special effects available with the use of the KLR and STAR600 highly attractive, while others immediately saw the cost-saving benefits of the ACS system. “I could save so much money by not only cutting down on the number of lights needed, but also in saved time not having to reposition lights for each set change,” said one visitor.